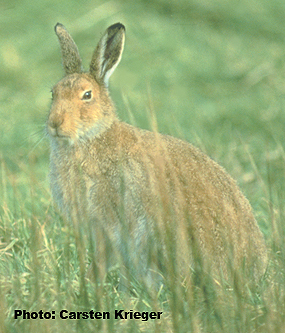 The Irish hare (Giorra Éireannach) is a native mammal that is widespread in Ireland. They can be found both in upland and lowland grassland, bogland or coastal habitats and even in urban environments such as retail/office spaces in located on the edges of our towns. Although the brown hare was introduced into Ireland the population is believed to be low and confined to Northern Ireland and this makes the fox the top predator to the Irish Hare. The male hare is referred to as a jack, the female hare is referred to as a jill and young hares are referred to as leverets. The Irish hare has fur that is brown in colour on its back, white fur on its tail and underbelly and it also has ears that are shorter then the length of the head with black tips. The Irish Hare does not hibernate. The saying ‘as mad as a march hare’ was said to come from the strange behaviour hares displayed during the breeding season in March however today it is known that the hares breeding season extends from January through to November. It is believed that the saying became popular when the author Lewis Carroll introduced us to the ‘March Hare’ in his children’s book ‘Alice’s Adventures in Wonderland’ published in 1865. Female hares can have 1-3 leverets in each litter. The female can even fall pregnant whilst already pregnant and therefore carry two litters of different development stages at once. Hares do not burrow like rabbits, they live in a form which is a shallow depression hidden in dense vegetation. They are herbivores and their digestive system is not as developed as ours and therefore the Irish hare will eat its food twice. That is the Irish hare will feed on their own droppings as they can still contain valuable nutrients needed for the hares development. This entry was posted in Wildlife Watch at the Bog of Allen Nature Centre and tagged Activities, Attraction, biodiversity, Bog of Allen Nature Centre, Bogs, Conservation, Education, Events, experience, Family Nature Activities, IPCC. Bookmark the permalink.